To enable further understanding of what type of contractor you are classified as by Queensland Urban Utilities, please review Queensland Urban Utilities' Procurement & Sourcing Procedure (in draft) and Contractor WHS Management Standard Operating Procedure. A risk assessment must be developed in consultation with all interested parties and understood by all Contractors and Queensland Urban Utilities workers. Information provided to Queensland Urban Utilities must address specific legislation, industry codes, and standards relevant to all hazards / risks and work conditions. All prepared information should then be provided to the relevant Queensland Urban Utilities Contract/Project Manager/Queensland Urban Utilities Person in Control of Worksite prior to commencement of work (or upon agreed arrangement with the Project/ Contract Manager/PICOW). The Principal Contractor for a construction project must prepare a documented Work Health and Safety Management Plan before work on a construction project commences. 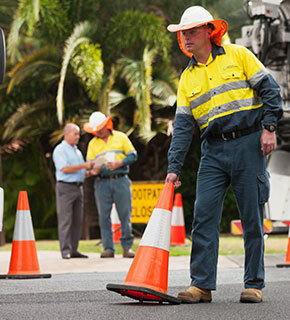 All contractors, other than a ‘Principle Contractor’ as defined by Queensland Urban Utilities, should prepare relevant WHS documentation and complete the WHS Documentation Checklist (CHE452) and submit to the relevant Queensland Urban Utilities Supervisor or PICOW, at least 48hrs prior to arriving on a Queensland Urban Utilities site. If this information is not submitted, access to site may be denied until further information has been provided. Within Queensland Urban Utilities, there are specific Information, Training & Authorisation requirements that must be understood, and where necessary, contractors must be trained and/or inducted in these procedures prior to commencing work on Queensland Urban Utilities sites. Note: If you are unsure whether these requirements apply to you as a contractor, please speak with your relevant Queensland Urban Utilities contact representative. Queensland Urban Utilities Contract/ Project Managers will be able to provide you with further information regarding additional Information, training and authorisation requirements.